'On average, I make one violin or viola every three to four weeks'. Stepping into Matthieu Besseling's workshop at the rear of a patrician Amsterdam house, one is immediately impressed with the contrast between the old and the new. A vivid Karel Appel etching hangs on an exposed brick wall from centuries past. An interesting collection of violin and viola bows from bygone eras encourages visitors to play on recently completed instruments. Besseling, a tall youthful man with a shy smile, reflects the serenity of his work place and emphasises the importance of a peaceful environment. 'On average, I make one violin or viola every three to four weeks. I need to work in quiet surroundings to create the sound particular to the instrument. Like a painter working with a palette of colour, the violin maker mixes colours and textures to make a sound.' The temptation to make a comparison between Appel's artwork and the lively texture of a Besseling viola with a pearwood back hanging nearby lingers. Like many luthiers, Besseling was exposed to music at an early age. He build his first instrument before reaching his teens. His father, an avid amateur violin maker, encouraged his son both as a violinist and as a luthier. The elder Besseling's contact with the American varnish expert, Michelman, culminated in a visit by the innovator that provided the young Besseling with a great deal of food for thought. Besseling 's music activities add another dimension to his craftsmanship. As a violist, he engages in regular piano quartet sessions culminating in several performance each year. This active pursuit of another aspect of the music profession not only keeps him in touch with other players, but 'helps to maintain another type of contact to instruments, a real contact to their sound.' While working on a new instrument, Besseling often takes breaks to practice the viola, switching from creating to playing. 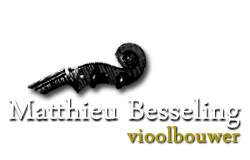 A man of noticeable modesty, Besseling points out that his commitment to performance is not exceptional among luthiers. 'There is striking evidence that many of the makers from the past were able to play their instruments well, sometimes at a professional level. This is not only true of the old Italians: Stainer was a fine player too, and among the 'modern' Italians, Bisiach, Ornati, Poggi, Pressenda and Sacconi were advanced musicians as well. 'More than in the past, today's violin making flourishes in an environment of woodwork rather than the world of music.' One reason could be that violin-making schools are kept outside the realm of the conservatory. Taking examples from the Renaissance, he adds, 'originally instruments were made by players themselves. Later when the art became more specialised, instruments were made by makers in close contact with musical performance.' This relationship between playing and making is central to Besseling's philosophy. In the harmony of his surroundings, he continues his well-thought-out experimentation.